SE 136th Avenue will be completely repaved and have sidewalks added where they currently do not exist as part of PBOT's largest Fixing Our Streets project. Photo by the Portland Bureau of Transportation. 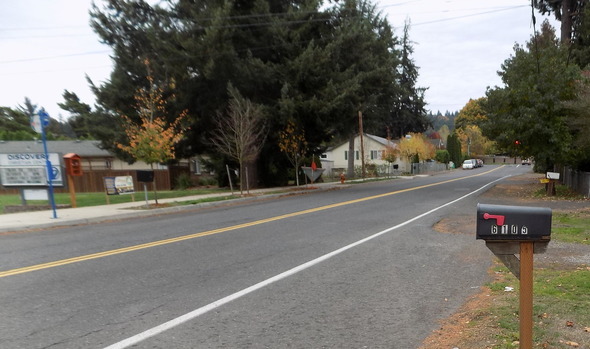 (Feb. 5, 2019) Portland's largest Fixing Our Streets project is focused on pavement rehabilitation on SE 136th Avenue between SE Division Street and SE Foster Road. This project combines $4 million of investments from Fixing Our Streets to repave SE 136th Avenue and is leveraging an additional $2.7 million of Transportation System Development Charges (TSDCs) to build new sidewalks and curb ramps along the corridor. The project will also include over 50 new street trees, stormwater and street lighting improvements, and new crosswalks to improve access to two transit lines serving SE 136th Avenue. PBOT is also providing opportunities for residents to help shape the future of this street. Residents will have the opportunity to have trees planted on their property and to provide input on the type of trees that are planted. We encourage property owners on the west side of SE 136th Avenue to tell us more about their frontage using our online form. SE 136th Avenue is a primary Safe Routes to School route and a major city bikeway. The biking and walking enhancements on SE 136th Avenue will help connect families to new bicycle infrastructure on SE Division Street and SE Powell Boulevard. Children will be able to walk more safely to Gilbert Park and Gilbert Heights elementary schools located nearby SE 136th Avenue. Other areas that will gain improved walking and biking access as a result of this project include: Powell Butte Nature Park, Gilbert Hydro Park, Gilbert Primary Park, Leach Botanical Garden, Zenger Farm, Lincoln Park, Lincoln Park Elementary School, Gates Park, Gilbert Heights Park, Kingsley D. Bundy Park, Arthur Academy and David Douglas High School.